Product #6624 | SKU MF504HD-546BK | 0.0 (no ratings yet) Thanks for your rating! 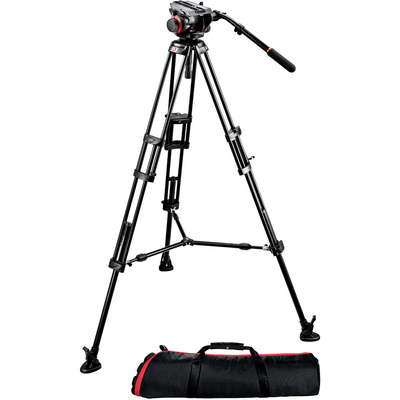 The Manfrotto - 504HD.546BK Aluminium Tripod System combines the innovative and stylish 504HD Fluid Video Head with the 2-stage aluminium 546B Pro Video Tripod--creating an ideal combo of affordability, stability, and smooth, precise control. This compact, versatile system was designed with independent video and DSLR shooters in mind, and provides the level of ergonomics and support required by today's small crews and one-man bands. 504HD Fluid Video Head - The 504HD's patented Bridging Technology allows for a wider top plate and longer sliding plate that add stability and balance to a set of state-of-the-art professional features. A newly designed counterbalance system includes four presets--from 0 to 7.5 kg --enabling proper balance for camera loads up to 7.5 kg, while 3/8" threads in the top plate allow attachment of monitors, arms, and other accessories directly to the head. 546B Tripod - This aluminium two-stage tripod combines stability and strength with affordability. Reaching a maximum height of 154cm, the 546B is capable of supporting up to 20 kg. Its spiked feet come with rubber overshoes, allowing setups on both smooth floors and uneven surfaces, while a newly designed mid-level telescopic spreader keeps the legs exactly where you need them. The 504HD's patented Bridging Technology allows for a wider top plate and longer sliding plate that add stability and balance to a set of state-of-the-art professional features. A newly designed counterbalance system includes four presets--from 0 to 7.5 kg --enabling proper balance for camera loads up to 9 kg, while 3/8" threads in the top plate allow attachment of monitors, arms, and other accessories directly to the head. This aluminium two-stage tripod combines stability and strength with affordability. Reaching a maximum height of 154 cm, the 546B is capable of supporting up to 20 kg. Its spiked feet come with rubber overshoes, allowing setups on both smooth floors and uneven surfaces, while a newly designed mid-level telescopic spreader keeps the legs exactly where you need them.